Broward Real Estate: Free live music weekends & week nights at Band Shell on Hollywood Beach! 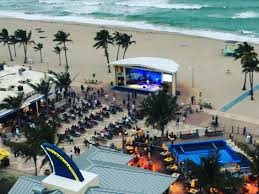 Offering free live entertainment, a band shell on the beach is an iconic venue in Broward. The open-air outdoor theater at Johnson Street on The Broadwalk features free music performances several evenings during the week, most Wednesdays to Sundays. Parking options include metered spaces on side streets at $1.50 an hour Mondays to Thursdays and $2 an hour Friday, Saturdays, Sundays and holidays; parking garage at 300 Connecticut St., $1.50 an hour. Margaritaville Beach Resort parking garage, 1111 N. Ocean Drive, is $3 an hour weekdays and $4 an hour weekends. This is a great opportunity to spend family time on the breathtaking Hollywood Beach while listening to live music and enjoying the outdoors!